Home » News » Museums Blog: Still looking for things to do in the holidays? Museums Blog: Still looking for things to do in the holidays? This week we are on the move in the search for family friendly things to do in Suffolk’s museums. Although the first image of a museum that will typically come to most people’s minds is a static display of some kind, there are plenty with moving parts. And in somecases the fun starts before you even get there! Ipswich Transport Museum is located on the edge of town in the old trolley bus depot in Cobham Road. Throughout August it operates a free Sunday bus service to and from the railway station via the town centre, which really adds to the visitor experience. Unless it is running a special event (and fire engine enthusiasts in particular should note that there is one of those coming up next Bank Holiday Monday) the ride generally ends at the doors. But visitors can still enjoy boarding some of the other vehicles to see inside (and may get to ring the occasional bell…) The model railway is popular with many younger visitors. The volunteers who run the museum (and carry out the restoration work) make a real effort to engage with visitors of all ages and are a fund of information and stories about the collection, which extends from trams and trolley buses to police cars and even prams. A family ticket will save you money if your party extends to 2 adults and 3 children. Further north, the East Anglia Transport Museum at Carlton Colville spreads across a site where it is able to offer regular rides– on trolley buses, trams and even a short stretch of railway. All these come free with the price of admission. There are some lovely touches to the street scenes around the site (like the old-fashioned shop front and a phone box with buttons A and B). Assorted sheds and buildings house a vast collection of different vehicles and there’s a fascinating section devoted to the story of road-building which includes a re-creation of a living van and horse-drawn water cart. 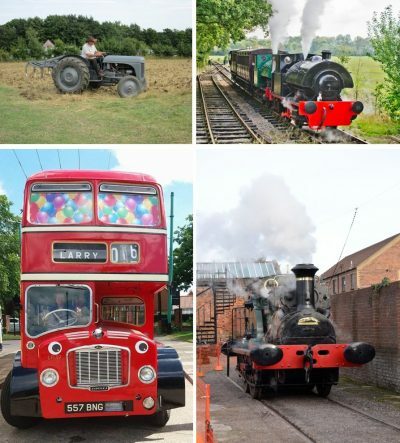 For fans of rail, Suffolk’s Museum of the Year in 2014, the Mid-Suffolk Light Railway, offers steam-hauled rides every Sunday (although the hot weather is having a bit of an effect on the steam trains so do check the museum website before you visit). Brockford station can take a bit of finding, although when you get there you will understand why. Affectionately known as the ‘Middy’, it was a rural railway built in Edwardian times but never fully completed. It would have disappeared into obscurity altogether, were it not for the ardent enthusiasts who, in the 1990s, began carefully resurrecting a section of railway together with the original buildings. The Middy volunteers, who continue to maintain and restore the rolling stock, pull out all the stops to recreate a memorably quirky experience of a bygone era for all ages of visitors. An added attraction, for the grown-ups at least, is its “pub” – the Kitchener Arms – housed in a railway carriage, of course! If it is engineering, agricultural machinery or other kinds of steam engines that excite you, the Museum of East Anglian Life in Stowmarket and the Long Shop Museum in Leiston also have items of interest. For something completely different, however, you might like to marvel at the workings of Woodbridge’s Living Tide Mill. Providing you time your visit to fit in with the out-going tide, you can see lots of enormous wooden wheels and shafts in glorious, water-driven, motion. Restored to working order thanks to yet another band of dedicated supporters, this museum does an excellent job of explaining why and how such a huge building was required to turn the grain grown in the fields into the flour for people’s daily bread. Descriptions of the roles of the various characters involved in the process include that of the miller’s cat, and children can have fun scampering about looking for pictures of mice. If you haven’t already, take a look at the Summer in Suffolk Museums line-up to see what’s happening in a museum near you this summer.